Week 2 Day 8, May 14th. Celles - sur- Plaine. Today we awoke to a rather dull start after a night of rain. Ever hopeful we headed off on our bikes to tour the nearby lake with a picnic in the rucksack. 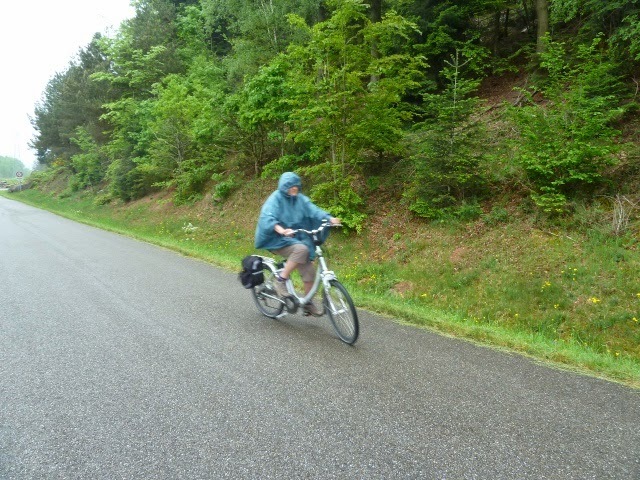 After approx 2kms it started to rain, we donned our raincoats and carried on - the rain became worse and we made an executive decision to return to the campsite. By the time we got back we were thoroughly soaked! Carol makes haste to no avail - still got a thorough soaking! Coffee and cake followed chez Rex and we also ate our picnic in the van. Later the rain abated and we retraced our route to the Lake Pierre Percée (Drilled Rock - I think). There followed another hill climb of 2 kms up to a barrage with views across the vast lake/reservoir. The lake was built to supplement a river because at times there was not enough water to cool the nearby nuclear power station. At the same time they built an underground pipe to feed a leisure lake (where our campsite is) which drives a hydro electric plant - all underground. The power plant generates 18,000 kW and the second lake is a leisure site with canoes, swimming etc. Carol contemplating the possibility of another soaking! A cup of tea in the van and for a moment the sun shone teasing us before the heavens opened again! 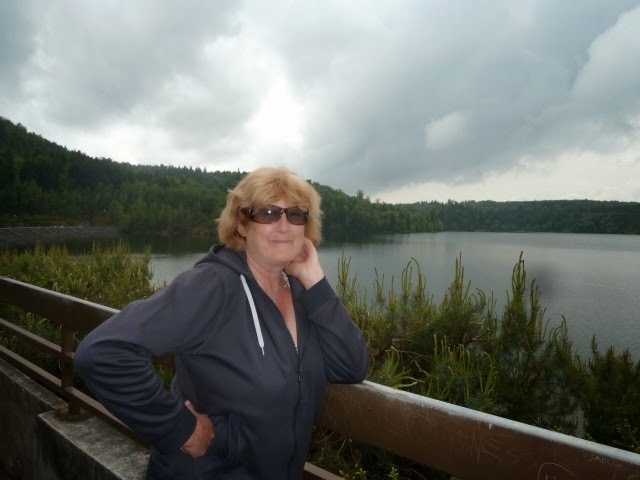 Still at least we have booked a table at Hotel des Lacs - yes oh Yes -C) and it is a 5 minutes walk away so we shouldn't get too wet! So we had dinner at the Hotel des Lacs - we had the fixed price menu which started with hors d'oeuvres riche- woo! - what arrived was a platter of salad items with a slice of luncheon meat and egg mayonnaise liken'd to the salad bar at a Pizza Hut - we were slightly disappointed. However the main was nice - Graham had fillet mignon in a sauce brun with frites. Carol had fish of the day fresh au bout de la ligne (we think not) - salmon in a creamy sauce, with lovely dauphinois potatoes. Carol then tried ille flottante - soft meringue in custard sauce - which was nice but bet not as good as some. But at 19€ for 2 courses and 22.50€ for 3 it was very reasonably priced. Still raining as we retired - we will decide tomorrow if we stay or move on dependant on the forecast. Score for Camping des Lac 9/10. Great location. Free Wifi. Shame about the weather. Day 9, May 15th. 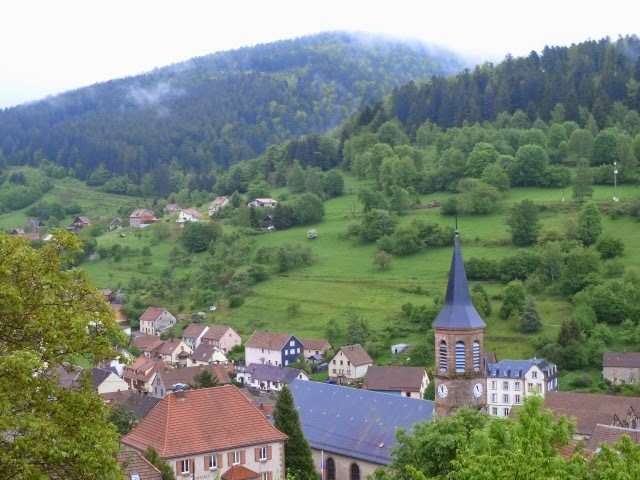 Celles - sur- Plaine - Obernai 72 miles. It was raining as we woke and so the decision was made to move on. The weather forecast shows rain for today - sunny periods from tomorrow until Tuesday when rain is predicted for several days. We decided to head for the Route de Vins in the hope of being able to cycle to some of the wine producing villages before the weather changes - Hic! We went up to the Col de Donan weaving our way upwards through pine clad hills - at the top where on a fine day you can see Germany and even the Swiss Alps. 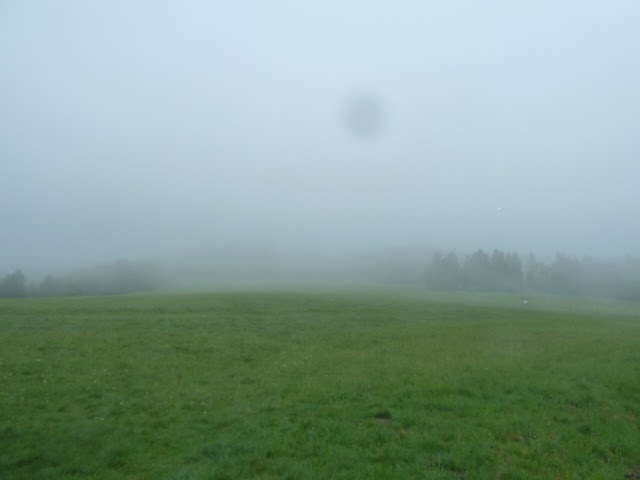 We saw - nothing - damp low clouds shrouded everywhere. Here is our view. 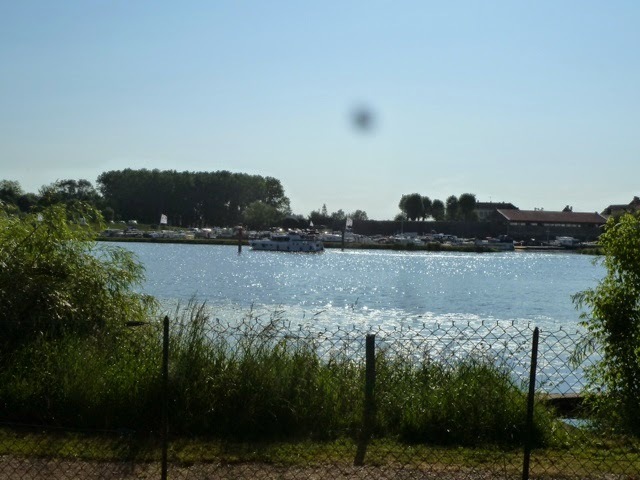 Please excuse the swarm of bee like image at the top of the picture - it is a problem with the camera which happened last year too and then fixed itself. In a navigation error we ended up in a remote but pretty village called Natzwiller. As the roads became ever narrower we were glad our van was quite small. Returning to the road we passed Le Struthof - the only concentration camp in France built by the Nazis during WW2. Apparently it is estimated that nearly 22,000 deportees lost their lives here between 1941 and 1945. We saw the huge monument dedicated to the Deported. It was clearly a popular attraction as there were lots of cars parked up - but we could not face entering the place and felt quite contemplative as we passed by, especially given the grim weather. Onwards to Le Hohwald which indeed was picturesque and looked to be a popular spot for walkers and tourists. Unfortunately both the Café and Salon de Thé were fermé - so we had a quick stroll round and headed off. 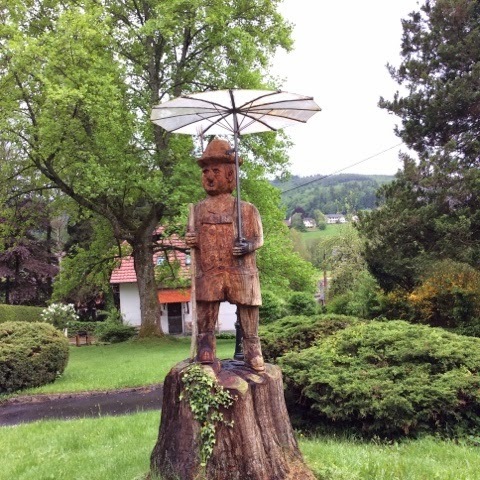 An interesting statue in the centre of le Hohwald. Is it a sunshade or an umbrella? 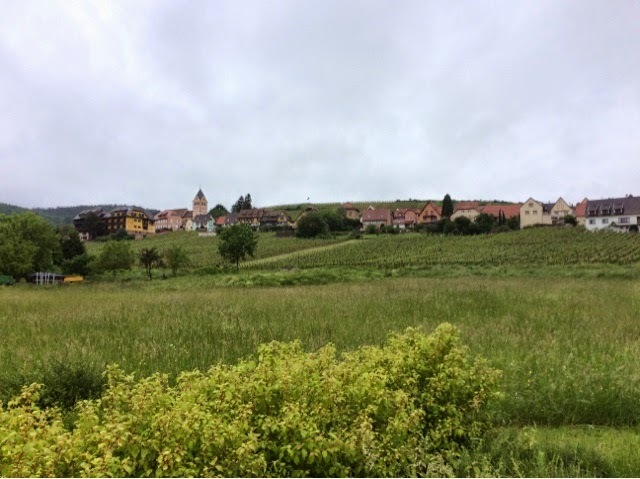 Drove on through Andlau, Eichhoffen, Intterwiller and had lunch chez Rex on the edge of Nothalten as the weather picked up - all villages on the Route de Vin. 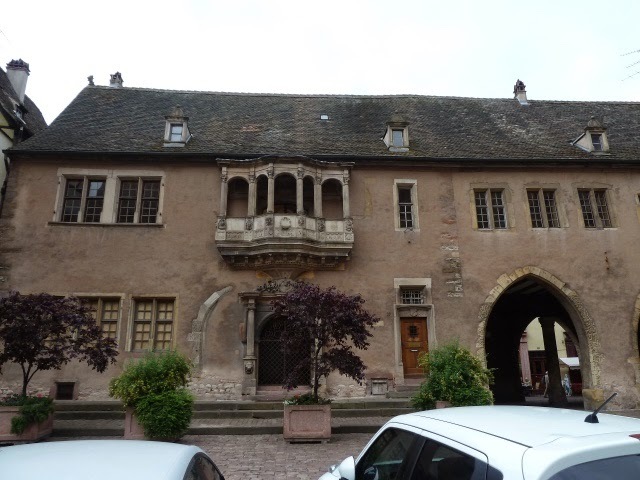 On to Sélestat for a supermarket shop in an enormous Leclerc and then parked up to visit the Maison du Pain. This is a museum dedicated to bread making. On entering we were given a couple of freshly baked bread rolls and sent on our way on the self guided tour. Well it was a good way to spend a rainy afternoon! and what we don't know about French bread making following the tour! 100 parts de farine, 62 parts de l'eau, 1,8 parts sel and 18 parts levure. Bake-off here we come. We headed off to Obernai to our next planned stop. As we arrived at the campsite a sign stated no more room for campervans! - so we turned to go when a kindly German Wolfgang ran up to us and said there was 1 more space left after him, and he had asked the site manager to reserve it for us as we had arrived just 1 minute after him. Danke schün Wolfgang! 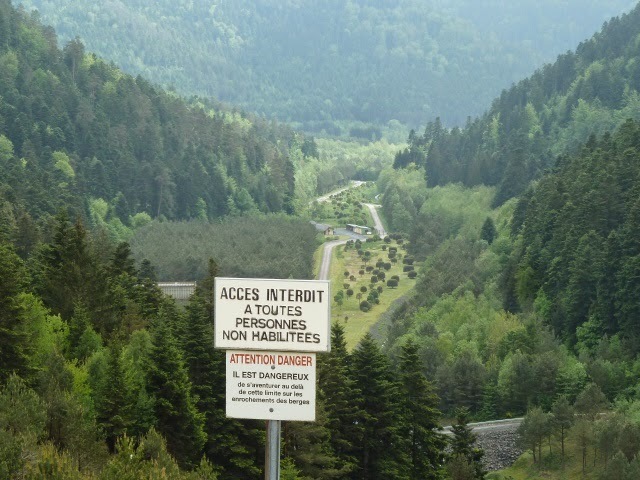 The site is very very busy - not what we are used to but we're happy to be in a conveniently based place for exploring some of the northern parts of the Route de Vins. Day 10. Obernai. May 16th. Cycle trip aprox 13 .5 kms. On again to Bischoffsheim again - fermé - and back to Obernai along a cycle path past vineyards. Obernai was ouvert! 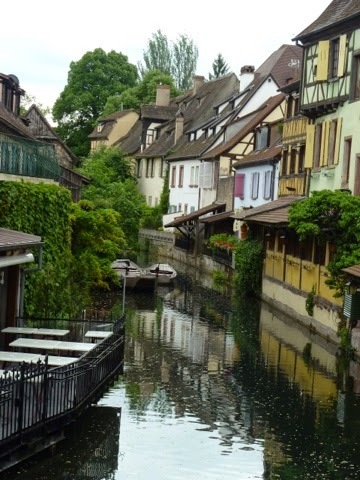 A pretty large touristy town with the usual timber framed alpine looking houses. We had lunch in a restaurant sitting outside in mostly sunshine. We noted the restaurant had a selection of vegan/vegetarian dishes - some with Tofu - rather unique in France! Carol had Tarte Flambé - a very thin based pizza like dish - with soft cheese base rather than tomato - with smoked ham and sundried tomatoes. Graham had Ravioli in a cream, fig and basil sauce. We shared half a carafe of white wine and had a leisurely lunchtime (this is more like it ! - C). A short leisurely cycle to the campsite and spent the rest of the afternoon chilling and plotting where to go next, and a back up plan if the weather becomes rainy for a prolonged period of time. Score for Le Vallon de L'Ehn. 8/10. Great location. We were last in so can't complain about rather noisy pitch overlooking the children's playground! Friendly site. Day 11. May 17th. 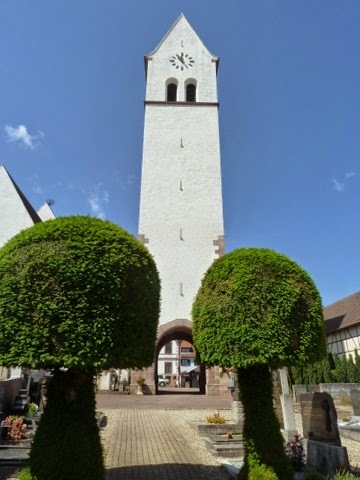 Obernai - Turckheim. 38 miles. Before departing we did a return cycle trip to see the villages to the south of us Obernai - Mittlebergheim. 30 kms. 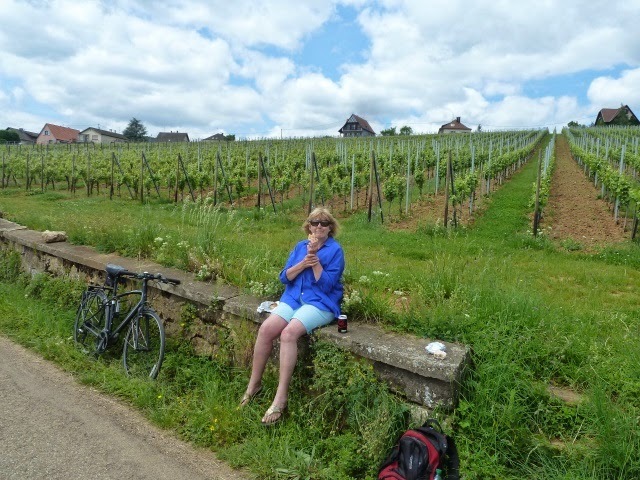 We packed a picnic and followed cycle paths through the vineyards - Bernardswiller - Goxwiller - Gertwiller (where there is a museum/shop of Gingerbread - Pain épice - apparently the gingerbread capital of the world!) We visited the shop but wracked with the usual indecision left with nothing! On to Barr a lovely town with a fabulous patisserie which we called in on the way back to purchase a couple of delicasies - including a mini Koffleburg - a local Alsacien cake. Then on to our last village Mittlelbergheim - another typical Alsacien village. We decided to turn back just before Andlau and retraced our tracks. 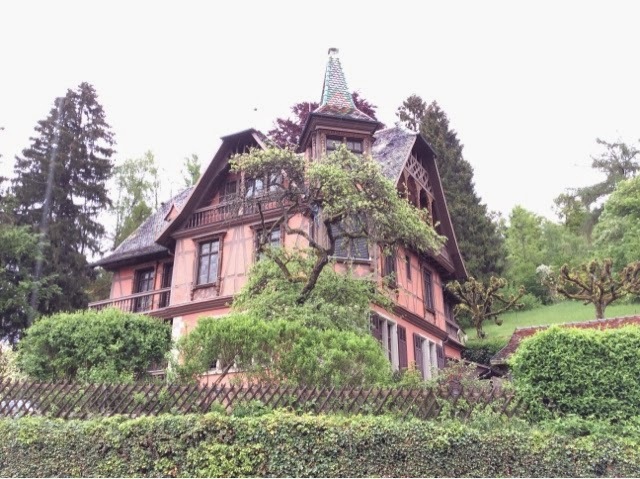 Back to Obernai and in the van for a short drive to Turckheim just south of Colmar. We are staying on a site on the outskirts of Turckheim. 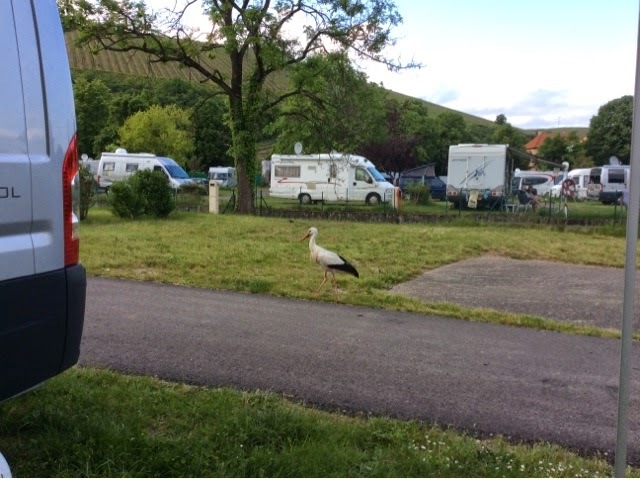 As we settled into our pitch a stork flew overhead and settled into a tree nearby - Colmar is famous for it's resident storks who nest in the city centre and also our campsite evidently! Our campsite stork on patrol. As we sat enjoying a couple of beers a couple peered over the adjoining hedge - Chris(tine) and John from near Birmingham - who came and kept us amused for an hour telling tales of their travels in their Brummie accents! Tomorrow the weather is promised to be good so we hope to get back on the bikes for more vineyard villages visiting - try saying that after a few ! After a walk in to Turckheim for picnic provisions we picked up the bikes and set off. It is a beautiful sunny day at last! 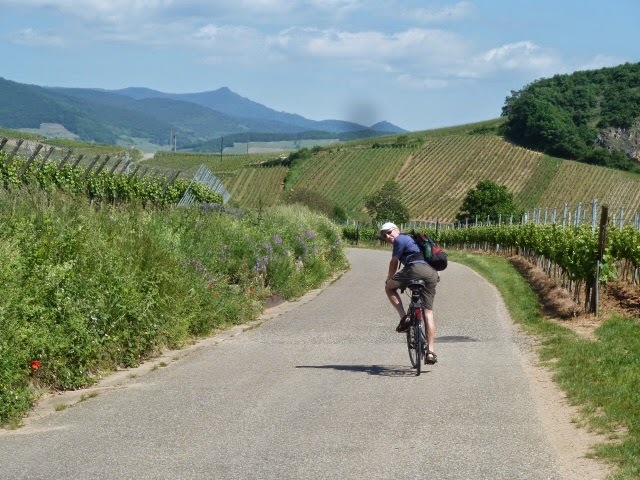 The cycle route took us through hillside vineyards although the inclines were a little more challenging than yesterday! We went via Katzenthal - how's this for a church tower! On via - Ammerschwihr - Sigolsheim - Kientzheim (gorgeous!) 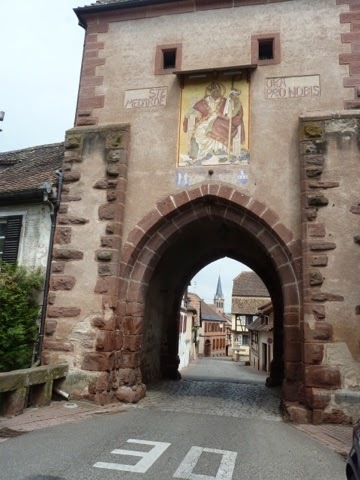 to Riquewihr. All the villages we passed through were picture postcard pretty and charming. The villages here are maybe a bit prettier than further north but the hills between are quite large, and the cycling was a lot easier up near Obernai. For anyone thinking of coming, get a cycle map from the tourist office. Between the fields there are single track roads used by viticulteurs and the odd local resident so are not shared with normal traffic and offer relaxing routes through spectacular scenery. 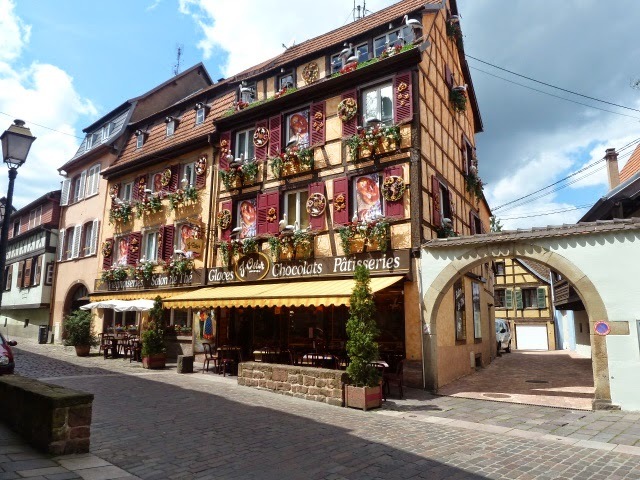 Riquewihr is a bit of a tourist trap full of coach parties calling by on their European tours. It is still very picturesque and well worth a visit. We picniqued sitting on a bench centre town in glorious sunshine and watched the world go by. After a circular walk around the town we had the obligatory ice cream before retracing our route back. Back to the van for a well deserved beer and shower. Sat under the awning with the sun still shining brightly - yippee! Tonight we are going to walk in to Turckheim centre for dinner in a restaurant (What 2 dinners out in less than a week !) a treat for Carol for enduring 2 consecutive days of cycle trips! We walked through the deserted streets of Turckheim peering into empty restaurants where we didn't want to be the only diners. Turned a corner and saw people at tables outside of one - the Auberge de la Comtessa - we requested a table inside and it was full of people! This must be the place to go! The decor was very French - a mix of grand style and lots of nic nacs - on our table we had a large lamp, a ceramic candlestick with lit candle, a decorative jug, a birdcage thing with plastic rabbits in it and a plastic bicycle! (this feels like one of those memory games) and still room for place settings! We enjoyed an interesting 3 course table d'hôte with the buzz of chatter around us - lovely. Won't go through the food but just to say we are always surprised when dining a la Francais - there is always something presented we did not anticipate or read in the menu. 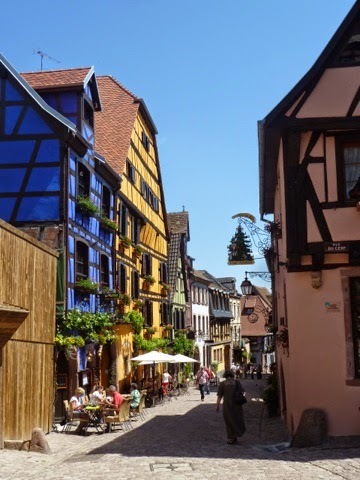 Today was promised to be a dull day so we caught a bus to Colmar - a town in the heart of the Alsatian vineyards - it's main attractions are the Musée d'Unterlinden and Petite Venise. The bus ride proved interesting as we had to change at a stop called Europe. We thought it would be a large shopping centre, but no. Europe appeared to be a large estate of social housing with stops en route called Rome, Berlin, Londres, Belgrade etc! We were directed to our connecting bus by the helpful bus driver and on to Colmar. As we stopped at a bus stop a young woman who had been sitting in front of us got off there from our previous bus got on to see the English couple from the previous bus grinning like loons - we'd beaten a local to a seat. Unfortunately the musée was closed for renovation (not another!). Fortunately the main attraction - the Issenheim Alterpiece has been relocated to the nearby Eglise des Dominicains. The Alterpiece painted by Matthias Grünewald at the beginning of the 16thC for the high alter at Issenheim is a masterpiece of expressionist style, colour, light, poetry and humour - apparently. It certainly was interesting hearing the audio interpretation of the symbolism within the paintings depicting the crucifiction,nativity and other lurid imaginary happenings to St Anthony. We didn't take any pictures as they never do justice to such images - however the thoughts we took with us was those painters certainly had a vivid imagination! Had lunch in the covered market - the cleanest and most diner friendly marché we have ever seen! On to Petite Venise which was definitely petite but very pretty. It was not the right weather for a punt on the water unfortunately. Back to the site and a cup of tea sitting in bright sunshine. Then on to the Caves de Turckhein for a little wine tasting. Graham told the sales lady he had never had Gewurtztraminer (lie!) and she felt duty bound to indoctrinate him to the virtues of Gewurtztraminer with a vertical tasting from different terroirs and maturations. When the time came to choose which wine to buy we were a little fuzzy on which ones we preferred, and left purchasing a Pinot Blanc and a Pinot Gris after all that! Later we sit chez Rex deliberating whether to stay in the area or move more South as poor weather is predicted after the weekend, further west is best at the moment. Score for Le Medieval - 9.5 /10. Great location near to town and bus and train links. Easy walk to centre. Clean and modern facilities. Free wifi. Friendly reception. Only lack of pool gave it a near perfect score. Day 14. May 20th. Turckheim to Auxonne. Having looked at the weather forecast which predicted rain for a week in a few days - we decided to head west with a view to going further south if the weather does not improve. So we headed for Dijon. A bit of a nothing day . Long drive and supermarket shop. Had lunch chez Rex by the river at Ranchot. On to Auxonne East of Dijon - the town is by the river Saone. Unfortunately one of our party we misread the description and the site is rather more rustic than anticipated. The swimming pool is the municipal one next door which is yet to be filled with water even though the ACSI guide says open from 15/5. Parked up overlooking the river. From now one we have strict rules about division of duties. It rained heavily on arrival but we managed a walk into the town before dinner Chez Rex but think we have seen as much as we wish. We have been spoilt staying near such lovely places in Alsace , this town looks a little run down - although had a rather magnificent church. So will leave tomorrow and head for Meursault. 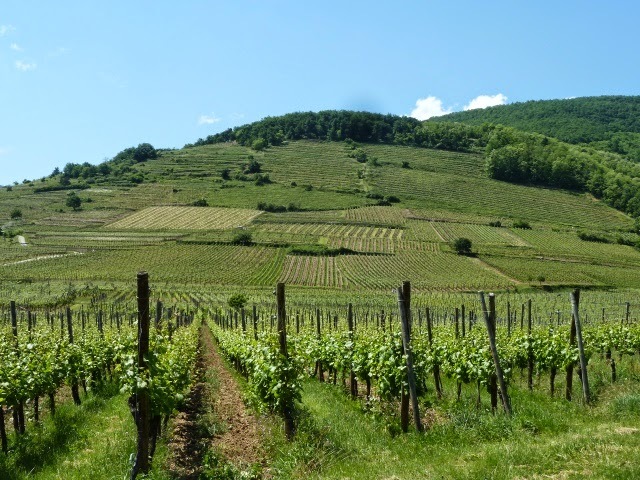 Funny how we seem to gravitate towards wine growing regions! Score for Camping De l'Arquebuse 6/10. Nicely situated - walking distance to town along the riverside. Restaurant on site. Looks to be well set up for children. Strong smell of strange tobacco near the office and sanitary facilities woeful.